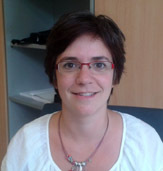 Mª Luz Guenaga is responsible of DeustoTech Learning research unit at the University of Deusto (Bilbao, Spain), also lecturer at the Engineering Faculty since 1998. She obtained her PhD in 2007 with the thesis “Integral Accessibility of Digital Resource Centers for People with Visual Disability”. Her research interests are innovative use of technology in education, instructional design, quality assessment of learning technology and content, usability and accessibility, and integration of audiovisual resources in education.